A supporter of Brazil's new president-elect, Jair Bolsonaro, celebrates in front of Bolsonaro's condominium at Barra da Tijuca neighborhood in Rio de Janeiro, Brazil, Oct. 29, 2018. Attempts to reform the bloated pension system have failed repeatedly and will again be met with opposition over everything from the retirement age — currently many retire in their early 50s — to who gets excluded from reforms. Bolsonaro has said he wants to exclude military personnel and police from any reduction in benefits. Supporters of Jair Bolsonaro, far-right lawmaker and presidential candidate of the Social Liberal Party (PSL), react after Bolsonaro wins the presidential race, in Brasilia, Brazil, Oct. 28, 2018. The rise of Bolsonaro, who cast himself as a political outsider despite a 27-year career in Congress parallels the resurgence of the far-right in Europe and elsewhere. 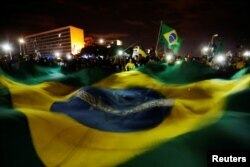 But his extreme messages were rendered more palatable by a perfect storm in Brazil: widespread anger at the political class after years of corruption, a sluggish economic recovery and a surge in violence that has many Brazilians worried about their future. 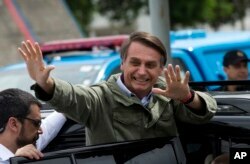 Jair Bolsonaro, presidential candidate with the Social Liberal Party, waves after voting in the presidential runoff election in Rio de Janeiro, Brazil, Oct. 28, 2018.